Good morning!!!! A little change for this Thursday - a multi-blogger giveaway! I created a group on Facebook for Midwestern Beauty Bloggers and a few of us have joined forced to bring you a great giveaway! For my portion, I chose an OPI polish (A Color So Hot It Berns), a Wet n Wild Megalast polish from last year's fall/Halloween collection (Poison Ivy) and a Nailtini polish (On The Rocks). I purchased each of these polishes with my own money. 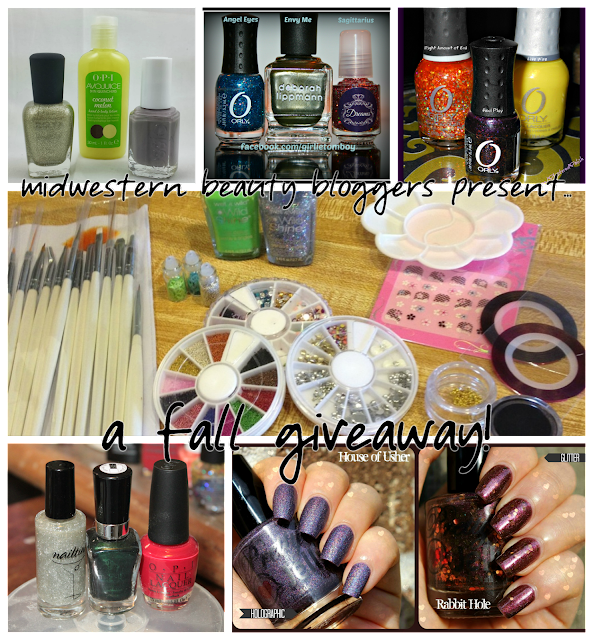 PRIZE: Prize Pack from Confessions of a Sarcastic Mom, Prize Pack from Darling Nails, Prize Pack from The Girlie Tomboy, Prize Pack from Liquid Jelly, Prize Pack from Plastered Polish, and a Prize Pack from Ruby's Nails. TO ENTER: In the Rafflecopter widget below enter your email address for one entry; additional entries may be obtained by following blogs, liking Facebook pages, etc. GIVEAWAY CLOSES: Wednesday, October 9th at 11:59 pm CST. NUMBER OF WINNERS: One winner per prize pack. PRIZE SHIPS: This giveaway is open to just the United States. OTHER STUFF: One entry per person is permitted. Duplicate entries will be deleted. The winner will be selected using Rafflecopter and announced on Thursday, October 10th as an update to this post. Once the winner has been selected they will have 48 hours to respond by email before a new winner is chosen.